Tanzania is home to the great migration and more national parks than any other African county – including two of the most renowned wildlife parks in the entire world. Our 5-day Tanzania safaris, which specifically include two nights in Serengeti National Park, have been designed to offer you more time in the Serengeti to witness the wildebeest migration. You will experience the excitement of game viewing in some of the most spectacular national wildlife game parks in Africa. This unforgettable Tanzanian safari journey will take you to the Ngorongoro Crater, featuring one of the highest concentrations of game in Africa. Here you will witness an amazing spectacle of African wildlife – inside a self-contained world teeming with animals. The tour will further take you to the Serengeti National Park, into the heart of wild Africa, a massive wilderness of 14500 square km, where every day brings a new landscape and a new adventure. You will visit the Lake Manyara National Park, one of Tanzania’s most dramatically located wildlife areas, consisting of a shallow but huge soda lake, at the foot of the Great Rift Valley’s western escarpment. This is a suggested or sample Tanzanian safari itinerary – it can be adapted to suit your own personal needs and preferences, as well as for any seasonal changes or migratory animal movements. Met on arrival at Kilimanjaro Airport. Transfer to Arusha Planet Lodge for dinner and overnight HB. (45km, 50 minutes). After breakfast, the tour departs. First stop is Arusha Town for any last minute purchases before we head off on safari. Afterward, we head to Lake Manyara. Lake Manyara National Park offers breathtaking views and a large variety of habitats. Acacia woodlands, water forests, baobab strewn cliffs, algae-streaked hot springs, swamps and the lake itself. And thanks to this the small Park is able to support a large number of animal species and incredible bird life. Manyara has the largest concentration of baboons anywhere in the world and the lions here are also renowned for their tree climbing. Dinner and overnight at Ngorongoro Kudu Lodge and Campsite. After breakfast at the campsite go for a full day game drive. depending on the season following the wildebeest’s migration. Dinner and overnight at Serengeti Seronera campsite. Early morning game drive and after depart to Ngorongoro Conservation area. We will stopover at Olduvai Gorge, boasting with a history dating back to the dawn of time. It was here, that the anthropologists Dr. Lois and Mary Leakey discovered the skulls of ‘Nutcracker Man’ and ‘Handy Man’, both very significant links in the chain of human evolution Late afternoon transfer to Ngorongoro Simba Campsite where you will have dinner and overnight. 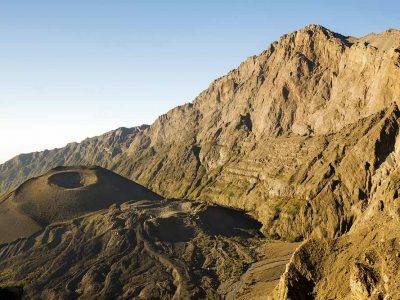 After an early breakfast, You will descend over 600 meters into the crater to view wildlife. Supported by a year-round water supply and fodder, the Ngorongoro Conservation Area supports the avast variety of animals, which include herds of wildebeest, zebra, buffalo, eland, warthog, hippo, and giant African elephants. Another big drawcard to this picturesque national park is its dense population of predators, which include lions, hyenas, jackals, cheetahs and the ever-elusive leopard, which sometimes requires a trained eye to spot. We will visit Lake Magadi, a large but shallow alkaline lake in the southwestern corner, which is one of the main features of the crater. A large number of flamingos, hippos and other water birds can usually be seen here. Late afternoon transfer to Arusha For dinner and Overnight or airport drop off. ( Accommodation can be included upon request at extra cost ).